Tatum's Mommy, Summer, is a amazing woman. Through the tragedy of giving birth to her stillborn son she started a organization to donate home made blankets to other parents who lost their babies too soon. On this page you can also find ways you can help by donating homemade blankets or yarn. Please show your support by visiting the link below. Tammy is yet another amazing mother to a angel named Evelyn, In her daughters name she created a beautiful organization to raise awareness and bring support and comfort to other grieving parents. 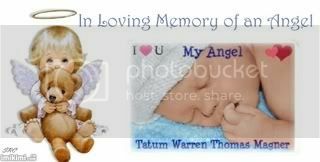 Her website also helps friends and family learn to support parents of angels babies. Please take a look a the Evelyn Rose Foundation Webpage and see what you can do to help make a difference! From the beginning of my pregnancy I've been visiting the forums on Whattoexpect.com. I've made wonderful friendships with the awesome mommies on the November boards (Teagan was due Nov. 4th). They have played an incredible role in my life and the encouragement with this group of woman is amazing.